But when grace is abandoned, and the love of God and others runs dry, the civil government by necessity must step up and expand in order to maintain order: Laws replace love, courts replace courtesy, policemen replace parenting, and freedom is lost. This is the sad condition of western civilization..
What’s needed in today’s culture is a return to the simple law of the Kingdom. If we were to once again embrace the love of God and others, much of the government’s burden would be handed back to individuals, and the cry for a nanny state would cease. The people should choose their leaders. (That’s democracy). They should choose leaders of wisdom and good character. 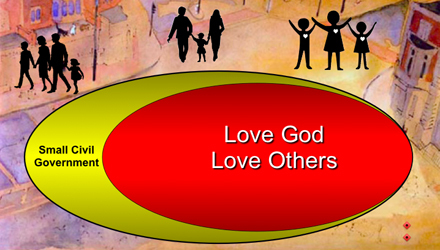 What I’m trying to show in these simple posts is that God’s kingdom plan addresses all of life. Kingdom people understand that the gospel is more than forgiveness alone; It is a way of life that includes everything from business to baseball, from homelessness to health care. On a personal note, I’m back in Maryland after a delightful weekend with the men of Shepherd Gate Church in Chantilly, Virginia. I spoke on “Identity and the Kingdom of God,” and had a rich time of friendship and challenge with these amazing brothers. Do you guys think that this passage from Moses to the Israelite tribes is related to Paul’s instructions to Timothy and Titus (appointing overseer’s/elders in the local churches)? Thanks for the feedback, guys! Each of you encourages me in your own delightful way. Steve – I think the Deuteronomy principle does (also) apply to the church. Principles of truth transfer from one sphere to the next. But my intention in these posts is to show that God has plans for EVERY sphere, and not just the church. I came across this quote as I have been curious to learn more about the people and influences that shaped the country of my birth. 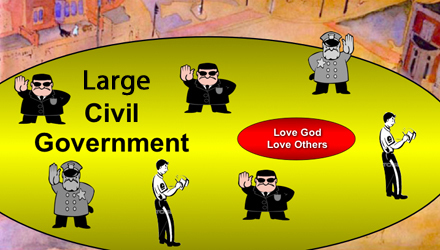 Imagine that the role of government was placed on a spectrum with tyranny on one end and anarchy on the other. I am understanding that the United States government was established to be as small as possible at the federal level and avoid the perils of anarchy. This makes sense to me in the light of the Adams quote above and your post, Don. When the vast majority of people in a nation embrace a common worldview (in this case, a primarily Biblical one) it is possible to have smaller role for civil government. But what about now? Is possible for a democracy or republic to effectively govern when there are multiple and opposing worldviews held among the people? It would be a real shame if people did not serve in civil government because they thought the only thing that made an eternal difference was some notion of “full time ministry” in the context of a local church. I am not diminishing the importance nor the primary role that the local church plays in God’s purpose of discipling nations, but a majority of us who follow Jesus are called to serve His purposes in other spheres of life not involving vocational roles “inside” the walls of the church or ministry – civil government is one such sphere. Thanks again for creating this space to learn and discuss these things. Your posts, and the comments from those who frequent your blog, are very insightful and continue to challenge me to grow in my understanding of Christ and the kingdom of God. Blessing to you, Don! Wish we didn’t live so far West now. It makes it more difficult than it was before to connect in person. I still hold a hope in the Lord that we will be able to spend some time together someday!